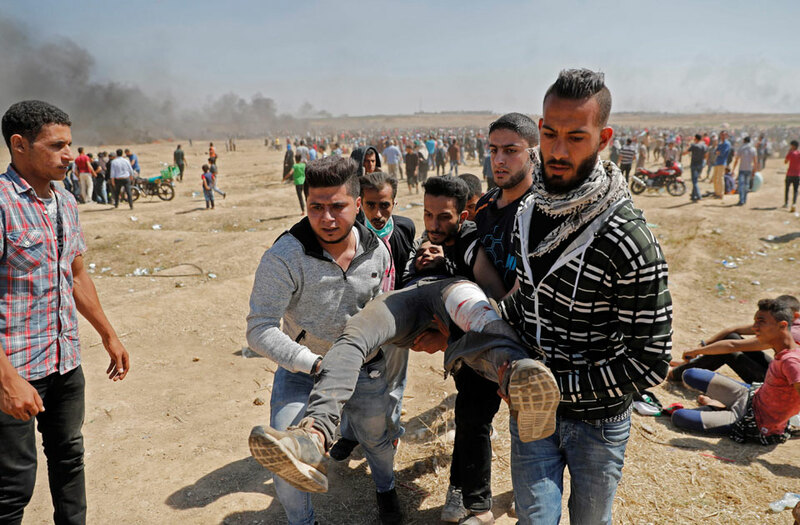 Palestinians carry a demonstrator injured during clashes with Israeli forces near the border between the Gaza strip and Israel east of Gaza City on May 14, 2018, as Palestinians protest over the inauguration of the US embassy following its controversial move to Jerusalem. 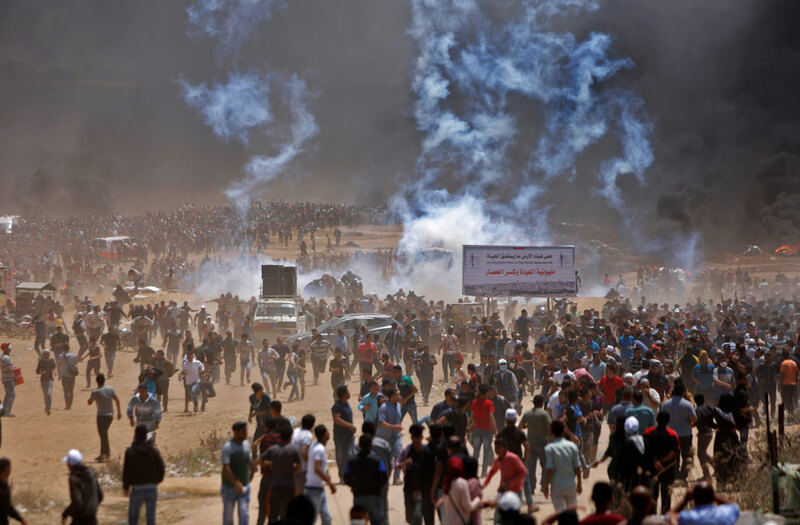 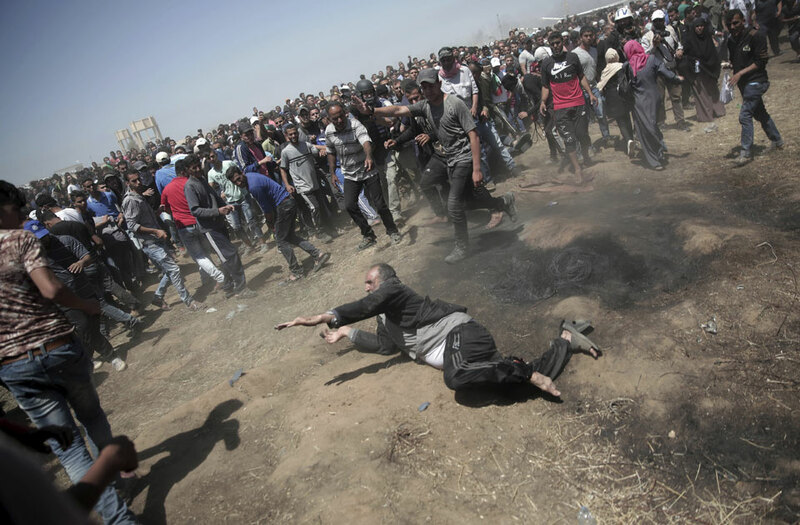 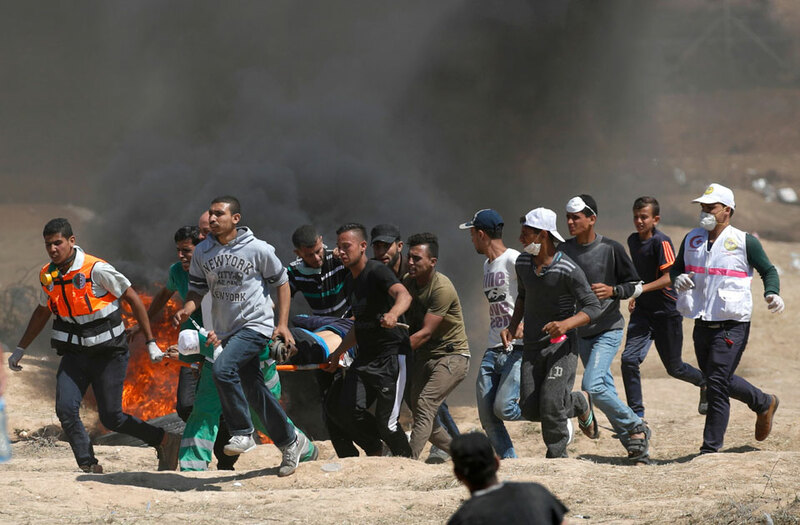 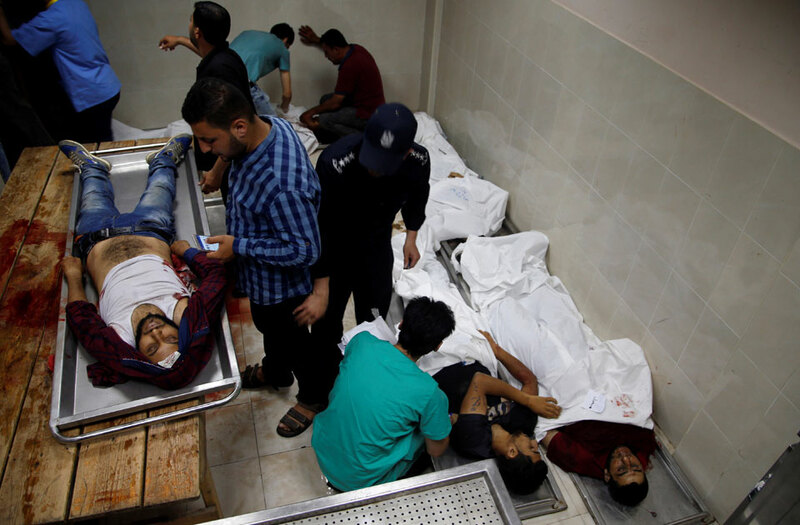 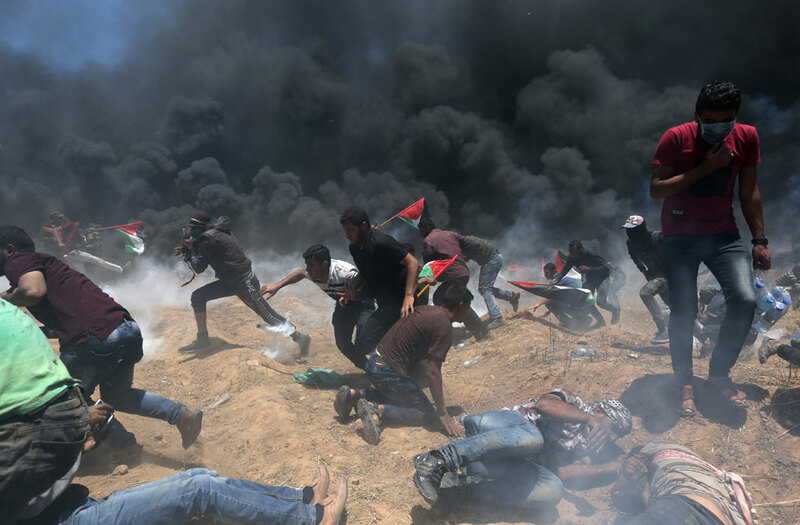 At least twenty-eight Palestinians were killed by Israeli fire on May 14 as tens of thousands protested and clashes erupted along the Gaza border against the US transfer of its embassy to Jerusalem, the Gazan health ministry said. 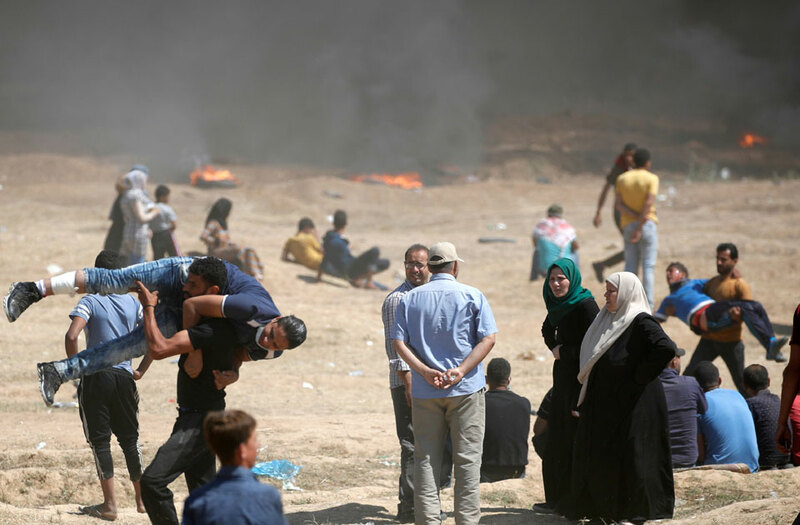 It was the deadliest day in the Israeli-Palestinian conflict since a 2014 war between the Jewish state and Gaza's Islamist rulers Hamas. 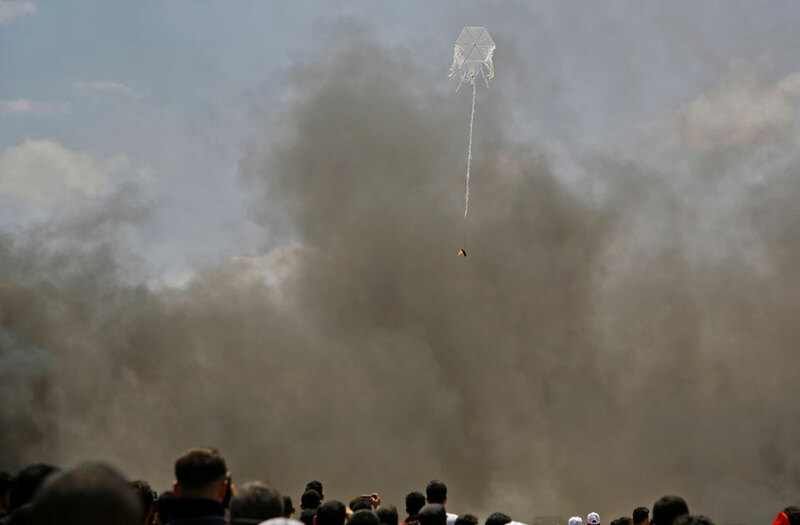 A kite loaded with a molotov cocktail is flown over the border between Israel and the Gaza Strip, east of Jabalia on May 14, 2018, as Palestinians protest over the inauguration of the US embassy following its controversial move to Jerusalem. 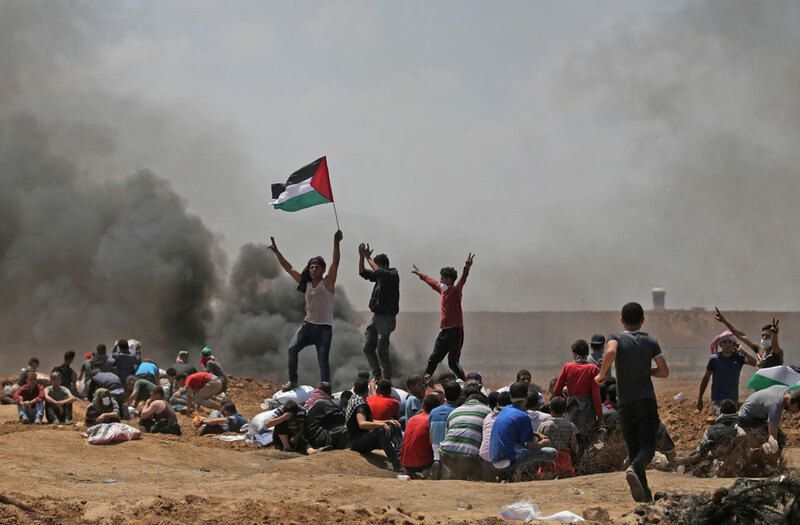 Palestinians wave their national flag as they demonstrate near the border between Israel and the Gaza Strip, east of Jabalia, against the inauguration of the US embassy following its controversial move to Jerusalem on May 14, 2018. 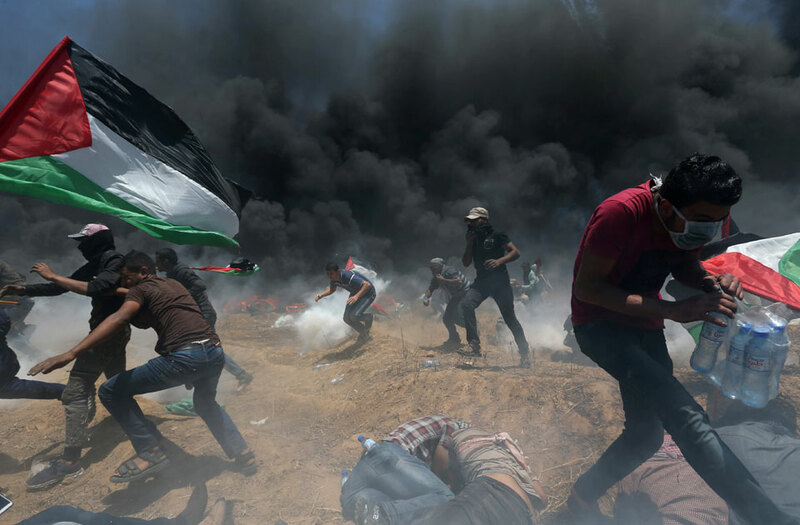 Palestinian demonstrators run for cover from Israeli fire and tear gas during a protest against U.S. embassy move to Jerusalem and ahead of the 70th anniversary of Nakba, at the Israel-Gaza border in the southern Gaza Strip May 14, 2018. 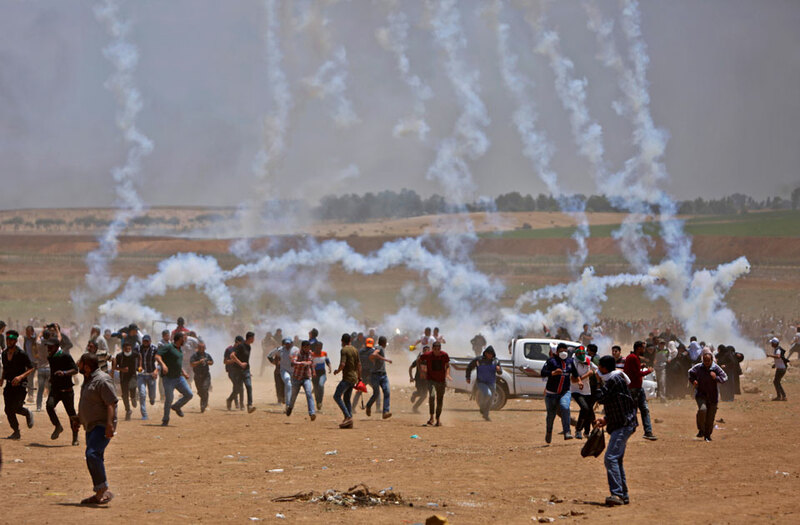 Palestinians run for cover from tear gas during clashes with Israeli security forces near the border between Israel and the Gaza Strip, east of Jabalia on May 14, 2018, as Palestinians protest over the inauguration of the US embassy following its controversial move to Jerusalem. 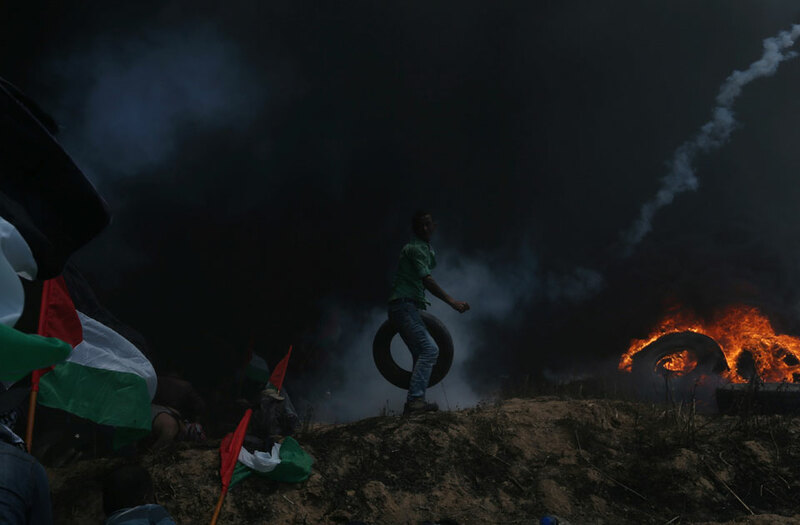 A Palestinian holds his national flag in the smoke billowing from burning tyres during clashes with Israeli forces near the border between the Gaza strip and Israel east of Gaza City on May 14, 2018, as Palestinians protest over the inauguration of the US embassy following its controversial move to Jerusalem. 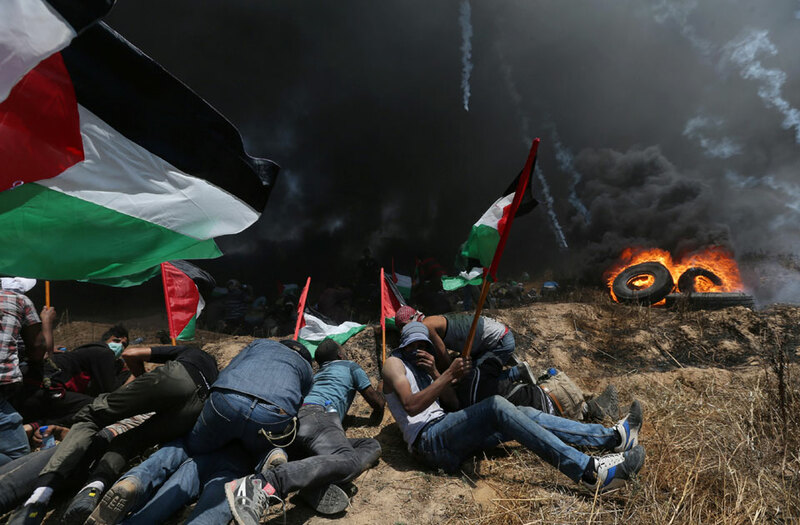 Palestinian demonstrators take cover from Israeli fire and tear gas during a protest against U.S. embassy move to Jerusalem and ahead of the 70th anniversary of Nakba, at the Israel-Gaza border in the southern Gaza Strip May 14, 2018. 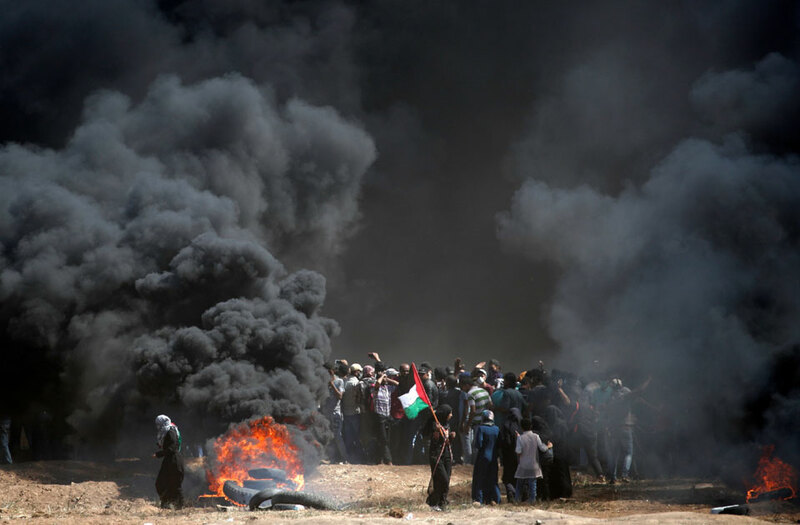 A Palestinian demonstrator carries a tire as others take cover from Israeli fire and tear gas during a protest against U.S. embassy move to Jerusalem and ahead of the 70th anniversary of Nakba, at the Israel-Gaza border in the southern Gaza Strip May 14, 2018. 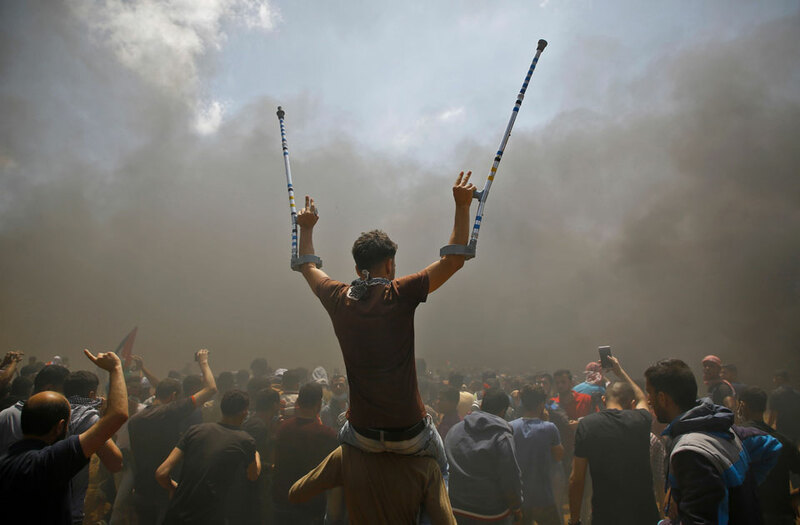 A Palestinian carries a demonstrator injured during clashes with Israeli forces near the border between the Gaza strip and Israel east of Gaza City on May 14, 2018, as Palestinians protest over the inauguration of the US embassy following its controversial move to Jerusalem.